Advantages: Excellent reference for German MiG-29s. • Color 4-view drawings with color references for both the Luftwaffe Norm 90J scheme and the original NVA green/brown tactical scheme. • Fold-out 1/48 scale drawings of the MiG-29A (G) and MiG-29UB (GT), including drawings of the missiles, pylons, and drop tanks. • 8 pages of detail photos covering the cockpit, landing gear, and engines. • A two-page section with 5 photos of the specially painted 40th Anniversary bird from JG 73 “Steinhof”. • Listing of individual aircraft by serial number, giving both the current Luftwaffe code numbers and the original NVA codes. The chapter text is in English, with a summary in German at the end of the book. All photos have captions in both languages. 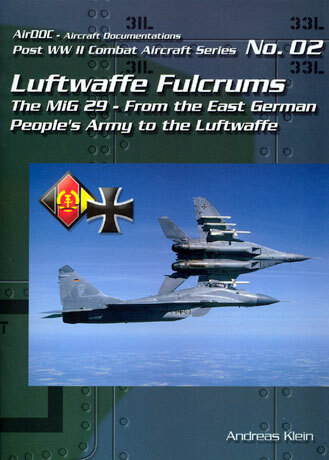 If you are interested in modeling the Fulcrum in German markings, this is all the reference you need. Highly Recommended! Review sample courtesy of my dwindling bank account.